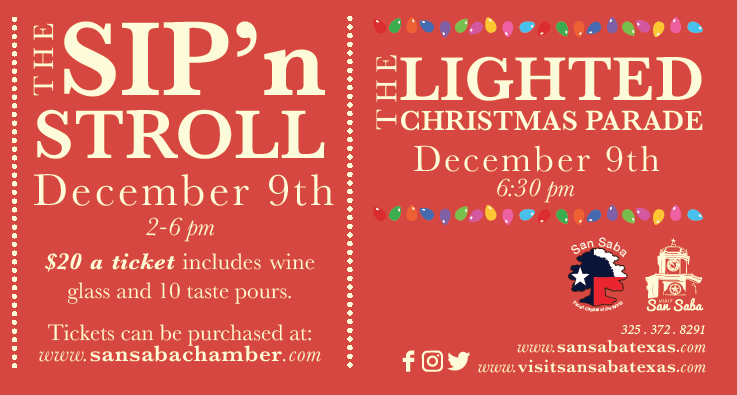 Join us for one of the biggest events of the year for the annual Sip n Stroll wine tour and Lighted Christmas Parade. The Sip n Stroll will last from 2-6pm featuring wine tastings as you stroll through historic downtown San Saba. Tickets are only $20 for 10 pours and a complimentary wine glass. The Sip n Stroll is immediately followed by the Lighted Christmas Parade through downtown.